Ballydehob “The Little Village with the Festive Heart” wil take place at the start of May. The Ballydehob Jazz Festival rolls out another outstanding programme featuring International Concert Headliners, Irish Supremos, a Live Music Trailall Weekend, Dance and Art Workshops, & the return of the Giant Puppets in the New Orleans Jazz Funeral Parade!! This years Festival, now in its 13th year, and entirely community driven is bigger and even bolder – over 50 Performances, 4 Days, 11 Venues… all in one gorgeous West CorkVillage. Ballydehob Jazz festival 2019 will feature artist and performers from all over the World! Announcing this year’s headline acts; Cork’sown ‘The Paul Dunlea Little Big Band, Paris’finest Jacks’&’Jill’s Swing Band’ and straight outta New Orleans ‘Stephanie Nilles’. As well as the best village Music Trail we have ever put on including the return of Guatemalan-based honky tonk pianist Nelson Lunding, Irish Songstress Clare Sands and her band, Festival favourites East Coast Jazz Band, the Parisian based Rooftop Barbershop, andlast but not least a 1920’s ragtime revival group The Goodnight Circusfrom Berlin! Entry to all Trail gigs is Free. 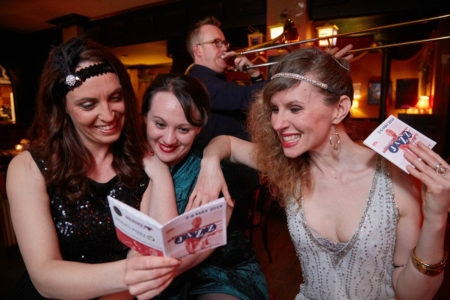 Ballydehob Jazz Festival kicked off with a bang this week at the Crane Lane Theatre in Cork. The festival runs from 3rd to the 6th of May in Ballydehob, West Cork. Pictured are Paul Dunlea, Trish Craddock, Laura Gourley and Colette Forde. Ballydehob Jazz Festival kicked off with a bang this week at the Crane Lane Theatre in Cork. The festival runs from 3rd to the 6th of May in Ballydehob, West Cork. Pictured are Joe O;Leary, Artistic Director of the festival and Colette Forde. The Paul Dunlea Little Big Band Septet utilizes some of Europe’s finest improvising musicians to produce a melodic, groove-driven music fusing jazz harmony, pop,funk and RnB. They will perform from a repertoire that includes a mix of classic big band and original material. As well as selling shows at Belfast Opera House, The Everyman andCork Opera House during the 2018 Guinness Cork Jazz Festival, Paul has also been invited by Saschal Vasandani to play trombone in The Big Band conducted by world famous band leader John Clayton at the Lincoln Centre in New York in celebration of the music of Nat King Cole. With beautiful improvisation and a repertoire of original compositions and arrangements coupled with phenomenal musicianship this unique show is a must-see. The Cork School of Music Big Bandwill open the night by performing a programme of classic and contemporary big band music, including compositions and arrangements by Cormac McCarthy, and CSM students and alumni. The Jack’s & Jill’s Swing Band is a group of musicians (and dancers!) who interpret a repertoire of jazz dancehall classics from the 20’s & 30’s. Their music is largely inspired by music in the style of Fats Waller, Louis Armstrong and Billie Holiday. The band regularly plays at the biggest nights of the Paris Swing Jazz scene, at major dance events and concerts for trad jazz aficionados. Their following has been expanding across the European swing dance scene, thanks to their bonhomie, excellent musicianship and interpretation of favorite classics of the early jazz dancehalls. Laissez les bon temps rouler! Delighted to welcome back to Ballydehob Jazz Fest; Chicago-born jazz/punk musician Stephanie Nilles. At twenty-two Stephanie graduated from the Cleveland Institute of Music with a degree in classical piano performance and temporarily relocated to New York City, where she began writing songs and performed regularly on the east village anti-folk scene. She has since sung with Bobby McFerrin in Carnegie Hall, directed the musical programme of a Brooklyn burlesque series, covered Busta Rhymes’ “Break Ya Neck” in the skeletal remains of a bombed-out cathedral in Nuremberg, been invited to perform official showcases at SXSW and International Folk Alliance, and self-released 5 full-length albums. Having electrified trail venues that were stuffed to the rafters in 2017 it’s a joy to have her return to the bigger stage of The Festival Hall. TICKETS for ALL Headline Gigs www.ballydehobjazzfestival.org (Early Bird / Combo Deals also Available). The Jazz Festival has something for everyone in each little corner of Ballydehob! The New Orleans Jazz Funeral Paradewhich takes place Saturday and Sunday evenings is now in its 5th year. A full Band, Dancers, Spectacular Costume, all led by ‘Catrina’ the Giant 15 Foot Puppet crafted here in Ballydehob Village and joined by ‘Diego’ her lover, equal in size and spectacle. Watch this space to see if it will be Love or War this year as they take the kids and their rather large dog for a walk through Ballydehob. Contact Festival Organizers ( ballydehobjazz@gmail.com) if you would like to participate in the Parade and Costume Workshops. The Jazz market on Sunday in The Festival Hall has over 40 stalls selling artisan products and local crafts all to the sound of some amazing live jazz trail acts and an all-day Children’s Clown Workshop. 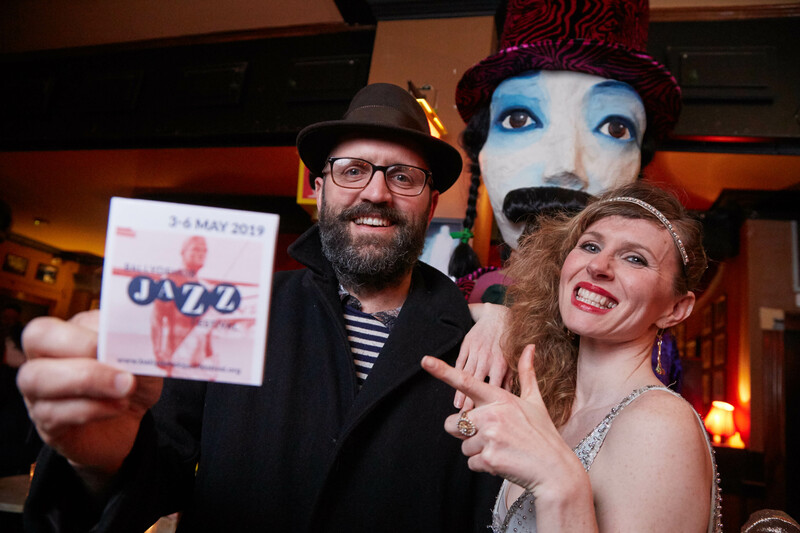 This ambitious festival is run entirely by local volunteers – led by Creative Director Joe O’Leary (FRED, LEVIS’ CORNERHOUSE) and an eclectic gang of music lovers and festival buffs who share a vision to promote the arts and entertain the masses. For more information on how to Book ART & DANCE workshop places OR Buy FESTIVAL HALL SHOW Tickets, OR on how to be a Jazz sponsor, go to the Festival Website -www.ballydehobjazzfestival.org. Ballydehob Jazz Festival is supported by the Arts Council of Ireland, Cork County Council ,and Fáilte Ireland and by local sponsorship.